DNG are delighted to present to the market No. 3 Hazel Road, a simply stunning two bedroom end of terrace property with excellent potential for further development (subject to PP). Benefiting from an array of convenient features to include double glazing throughout, secure off street parking and a glorious West facing garden, this immaculate property is perfect for first time buyers, investors or those looking to trade down to a turn key, low maintenance property in a prime and settled location. Accommodation on the ground floor is bright and effortlessly connected and includes extended entrance porch, open plan living room / kitchen and bathroom off. Upstairs there are two double bedrooms and large fully tiled family bathroom. The outdoor space in No. 3 cannot be overstated with an unrivalled West facing aspect, separate decked area and a large side space offering secure off street parking or potential for a fantastic side extension offering a future proof property for first time buyers and young families (subject to PP). Presented in turn key condition, the property leaves very little for its new owner to tend to and is ready to be enjoyed immediately. 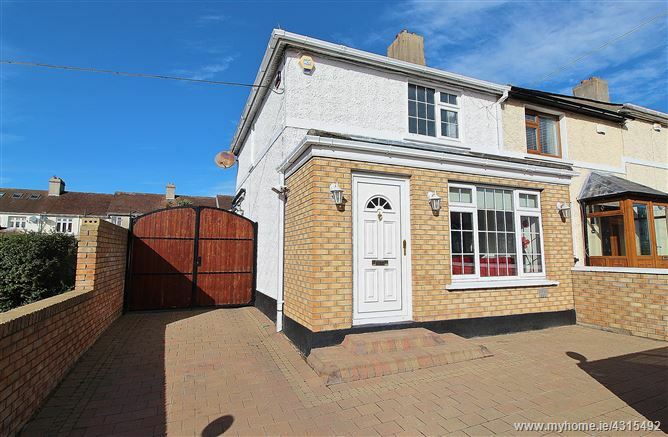 Hazel Road is situated just off the Malahide Road and is within a leisurely stroll of both Killester and Fairview Villages, Killester DART Station and is convenient to numerous bus services which run from Malahide Road. The area is also well serviced by an abundance of amenities available close by including excellent primary and secondary schools, a variety of shops, Beaumount Hospital and both the M50 and M1 motorways. Viewing is strongly recommended to appreciate this stunning property.